EQuIS Professional allows you to save and load filter selections to and from xml files. You can save filters after making filter selections. 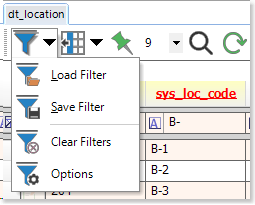 Selections can be made by clicking on the filter toggle icon to enable the filter row, and then entering filter preferences. To save the selections, click on the drop-down arrow next to the filter icon and select Save Filter. When the save window appears, give the file a name and click Save. Filters can be loaded by selecting the drop-down arrow next to the Filter toggle icon and selecting Load Filter. Navigate to the appropriate filter file and select Open. This will populate the filter row with all of the chosen selections that were saved in the file. When a filter is loaded into a file where other filter selections exist, the new selections will be added into the existing ones, instead of simply replacing them. If a filter is loaded to a file where one of the filtered columns does not exist, the message shown below will appear. When a filter has previously been loaded, EQuIS Professional will list it in the filter drop-down along with other recently used filters. This allows quick access to frequently used filters.